I'm here connected to the physical plane. You all know me as Johnakan-Ur-El, although you all know that in the spiritual planes the names don’t exist, but only vibrational concepts. There are many issues to talk about, but my 10% embodied has somehow the anxiety to know why, how, what for, and where the engrams are implanted. More than half a century has passed since the first basic theory was developed by the Master Ron Hubbard, when he said that engrams were hypnotic implants received at cellular level by the Reactive Mind, when the analytical mind was "off." Somehow it's like I'm going to modify this theory after almost ten years since the first time that my own 10% vessel has channeled me. The Professor Jorge Olguin. 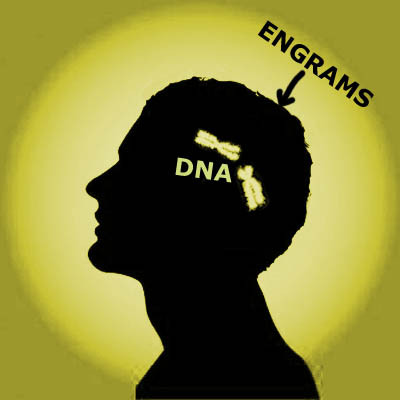 The engrams in the physical plane are implanted at DNA level, in the chromosome, for one simple reason. The basic question of my 10% was whether a person in a past life had a certain illness or disease; in the present life he or she may suffer similar symptoms that can reactivate those engrams from that previous life where that person had experienced problems at physical level. The question of my 10% was if there were two ways to see it, two among many others. When the spirit is going to embody in a future vessel, which will be the 10% embodied, the spirit has to know somehow that if he drags health engrams from past lives, it’s very likely that those engrams can be reactivated in this life so that the 10% embodied experiences certain symptoms. But in order to have these symptoms, the person must have a genetic predisposition. This genetic predisposition is altered by his/ her own engrams, those engrams are unconsciously carried by the spirit in his conceptual part. By carrying those engrams in his conceptual part, automatically, when embodying in that body, the fetus, those engrams alter the chromosomes so that that person develops the same symptoms in the future. That is, even efore the childbirth those engrams are modifying the person’s DNA so that in the future that human being has the same disorders. And copying myself from your words in the physical plane, it’s a neverending story because that thetan, who probably is in a plane of error, is capable to remember those past lives, where he has gone through adverse physical conditions, and involuntarily or unconsciously the thetan transmits to his 10% incarnated those engrams, and the incarnated person somehow develops the same symptoms he or she has had in a previous life. The symptoms don’t have to be exactly the same, but they might be similar symptoms. By having those symptoms, in turn, not only more engrams are implanted in the physical part, but also more engrams are implanted in the thetan's concept. Then, somehow the engrams, although it was said more than half a century ago by the master Ruanel in the physical plane, were implanted at cellular level, actually they are implanted at genetic level. And notice that this appreciation, my humble appreciation, fits in perfectly, because when the engrams are implanted at genetic level somehow it’s like they are changing the life of that person in the physical plane, and although the technique known as psychoauditing was dictated in this life to my 10% incarnated, so that he formalized it and he also applied it, my 10% in a past life as John of the Cross in Spain, in one of his works, "The dark night of the soul" notice that he made a kind of transformation where psychoauditing was mixed with psychointegration techniques, in this life, my vessel, has developed these techniques properly. Many times, and this is very important, because any average university student knows that families share not only experiences, but also genetic ties. How this theory fits in with what I have just developed? In one occasion, I transmitted to my 10% incarnated that karmic ties do not exist because no one owes anything to the other, even if he committed a hostile act against him, because karma is generated by oneself - that is, it is not necessary to reincarnate together in a next life to repair that mistake because karma is personal and one has to learn his own lessons, there are many cases where two or more spirits decide to embody together so that they are accompanied in a particular lesson. Then those spirits agree, we are talking about spirits that carry similar engrams from past lives, if they weren’t carrying similar engrams there wouldn’t be a way to accommodate the genetic apparatus, because the genetic apparatus is going to be adapted to certain types of engrams. If those engrams were absolutely opposed, if those engrams were accommodated according to what they are going to develop later on, they couldn’t be brothers, cousins, etc. Then the extended theory says that those beings, who in a past life shared similar engrams, can embody in this life as brothers or as father and son, or cousins, and they can develop in many cases similar physical ailments. This does not mean that it's always like this, because there are twin brothers who still have written in their genetic code a certain condition, It’s not a requirement that they develop the symptoms, but there it is, if you seek out, the mark is there. The most important thing is that psychoauditing alleviates physical problems by walking through the journey of those past lives of the various ailments that the thetan has gone through, I refer exclusively to physical problems, physical problems can be alleviated with psychoauditing. I don’t want to create conflict against medics, biologists, geneticists or researchers with what I'm saying. Here I’m simply saying that improving engramically a person, we improve his/her emotional state, and in many cases I do have this testimony and my 10% embodied also has testimonies of many people in the physical plane who has reversed terminal illnesses, and I say it so, and I’m responsible of what I , Johnakan-Ur-El, am saying; symptoms like this one you know as AIDS, which in fact is a retrovirus that invades the body deteriorating it and leaving it weak, with virtually no defenses against external factors, such as tumors that virtually disappear in front of a higher emotional state or higher tone scale, in favor, with euphoria, people who have reversed engrams and have gone through harmonious meditative states and they have reversed viral replicas... But I repeat, this message is not going against the medical science, absolutely not, we are not trying to replace the medical science. I simply want to say that it’s a complementary spiritual therapy that helps a lot to a person who has physical problems, but as a being of Light, I do not want to create false expectations because that would generate karma to myself and that would make me lower of plane, using a phrase of yours: “Take it with a grain of salt” because there is still a long way ahead of us. At the moment, nothing is the universal panacea except God’s energy, nothing is a panacea. There is a long way to go and just as I said at the beginning of this dialogue, in the physical plane karmas (and engrams) are recorded at genetic level, psychoauditing can modify chromosomes, I affirm it with total certainty. Finally, concluding this little concept, this humble concept, if you cut off your finger with a machine, psychoauditing will not make it grow back. I say this ironically because many people may misinterpret the message and believe that with this technique, they would have everything solved, and they would be greatly mistaken then. It's just a small way that adds a little and transmits hope. Strengthen yourselves to be better in order to help others. You all can’t do anything without starting with yourselves first. We are the Father’s tools, but we need to work well to be tools. Is that clear? So long. Johnakan-Ur-El spoke to you, fifth plane sublevel 9. An engram is recorded as an impression in the locus, which is the place that contains a segment of DNA, which stores the genetic information required to modify some aspect of the organism of the embodied being. Then, you will have new information in your chromosomes. Those experiences are determinant as traces in the genes; Somehow, they will affect you all as individual beings. Your response to external stimuli will be subjected to the impressions that you will receive and how the same impressions can, in turn, restimulate other engrams. Example of a situation related to engrams in the physical plane. Medium : Jorge Raul Olguín. "Dear Professor : First I must say I don’t know how I came across to your website, because I was looking for topics that have nothing to do with what you write, even now I wonder how I got here and I don’t find an answer, perhaps as you say, I am in time to know the truths of the new millennium. Professor, I had never heard about engrams, and I find it so interesting, I wanted to ask you about my son, who is 10 years old because he is afraid of blood, and everything that has to do with the body, for instance, at school he passed out twice when watching slides of the eye and the human body in general, he got scared and began to turn pale, he lost consciousness and peed his pants. That also happened when he broke his arm, he peed his pants and had a seizure, the same thing happened at the dentist's chair when he pulled out a milk tooth, he fainted and convulsed. In one occasion, during a film, which was displaying a documentary about the human body, it was terrible, few minutes after the film began it was displaying the brain, and he cried loudly, he fainted and had a seizure, he lost consciousness and we had to take him out of the cinema, when he came back to his senses he said he had nightmares. Ever since, those incidents did not happen again, but I am afraid that they could happen again at any moment, I must say that we have ran all kinds of tests, electrocardiogram, electroencephalogram, etc.., Apparently everything is fine, it is not epilepsy Doctors have ruled that out, he has received therapy with a psychologist to see if he loses the fear to blood, because I think that he’s especially scared of blood. A neurologist said that he had syncope, and he would overcome his conditions while he grows up. Reading what you said about engrams, I thought that that would be the answer of what he has, because he was born with cleft lip (only the lip, his palate was normal) and he had a surgery at the age of 2 months old, then another at the age of 8 months old. The last surgery was performed 3 years ago, with a plastic surgeon, now he’s almost perfect, he barely has a small scratch. Now that I have read all about engrams, I wonder if the engrams he acquired while he was unconscious in the operation room during the three surgeries he went through are the cause of his condition, I’ll wait for your answer and if the engrams are the cause of his condition, What can I do to help him? Thank you for your attention. Regards Laura. Ruanel: First of all, I inform you that the problem has nothing to do with his current incarnation. Interlocutor: Nothing to do with the surgeries he went through? Interlocutor: And Can his condition be solved? Ruanel: With Dianetic auditing, because it’s a minor issue. Interlocutor: What happened to him in that previous life? Ruanel: What happens to many people, he was murdered and he had a slow death, he saw his blood spilled on the floor. Interlocutor: Was he tortured too? Ruanel: No, he wasn’t, but his death was not immediate and that affected him for his next incarnation. Interlocutor: Did that happen many centuries ago? Ruanel: No, it was a recent event, in the last century. Around 35 or 40 years ago. Interlocutor: Did he embody in a short time after his disincarnation? Interlocutor: Was he a well-known personality? Ruanel: No, not really. Keep in mind that many people die in that way, but not all of them drag engrams later on. Interlocutor: Now, this boy is just 10 years old. Can he go to Dianetics or should he have to wait that he is an adult? Ruanel: There is no need to wait, her mother can send him now, but the boy will want to be there with a relative or someone he trust. Interlocutor: Could it be his mother the one who audits him herself? Ruanel: Of course that would be ideal! Interlocutor: Specifically, then, with Dianetics his condition would be something relatively easy to reverse. DISLEXIA, ASTIGMATISM, DALTONISM, AUTISM, BULIMIA, ANOREXIA, STUTTERING, SOME ALLERGIC RHINITIS, EPILEPSY (If the engram affected the brain at DNA level) There are many more engramic symptoms that become physical. IMPORTANT CLARIFICATION: There are positive emotional stages that can change the natural defenses, increasing them. There was one case in 1999 where a young man with HIV reduced 10% his viral replication per second, without taking any drug cocktail. This is real... But there were other people who did not reduce their viral replication! Then, we cannot advertise a technique that gives a 100% guarantee to eliminate engrams, but at the same time does not reverse health problems in the same proportion, because... What would happen to those people who represent the other 90%? Wouldn’t they feel deceived when seeing that their physical problems are not solved? We have to have ethics and be honest... One thing is to give the possibility of healing some people with a certain medical condition and another is to affirm that it’s possible to heal ALL of them. Engrams are not really "something physical" They cannot be located in any part. Actually what the engram does is "to modify" the gene affecting any enzyme that releases a "modifying force" ... and this enzyme has to do with the Locus. So, do not take literally that the engram is something tangible, because what is tangible is its "effect", not the engram itself. Finally, it would be a lack of respect to medical science if we were to believe that a spiritual technique could replace any conventional medical care or treatment, Although, it may serve as a supplement to any other healing. This entry was posted at Sunday, May 22, 2011 and is filed under Paradigms . You can follow any responses to this entry through the .